We have had tons of things going on in our world. First, I am happy to report that we are finally working out a deal with an international piano manufacturer to handle all of their social media and electronic marketing for them. I am hoping to see that happen in the next few days. I will keep you informed as that happens. I opened a way to be a silent billboard for music and lessons and your favorite things about music. 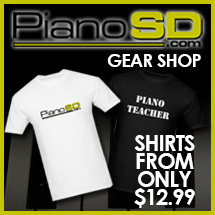 If you go to www.pianosd.spreadshirt.com you will see the site where you can purchase a t-shirt or make one with your own design. You can say anything you want, order it right there and it will be shipped directly to you or to a friend. Stop by and check it out at the address above. As we are building our social media for piano dealers, teachers, artists and others I hope to be able to bring you more things that will be fun and interesting. Going into the next few weeks we are going to be discussing Social media and how it can change your life. I noticed on the news tonight that Facebook and Twitter were the spark that started a rampage in Egypt. With the power of that media I am hoping to send the word to as many people as I can get to read, MUSIC IS FUN. Trying to imagine our life without music is almost impossible. I can’t imagine even one day of my life without music. If you think about it neither can you. On every hand and everywhere there is the sound of some type of music. What a great world we live in. I will be sending you more information about all of the above as soon as it all becomes available.